The explosive conclusion to the New York Times bestselling series. 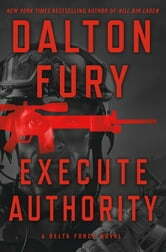 In Dalton Fury's Execute Authority, Kolt “Racer” Raynor and his Delta Force squadron are in Greece, providing VIP security for the newly elected—and deeply controversial—American president on his desperate mission to hold the NATO alliance together. Then, the unimaginable happens. Just as the president is arriving, an assassin’s bullet takes the life of the Greek prime minister. The president is safe, but Raynor recognizes the killer—Rasim Miric—by his grisly signature: a bullet through his target’s left eye. The hunt for the assassin ends when Miric, to all appearances, blows himself up in an explosion that levels an apartment block, but Raynor refuses to accept that the sniper is really dead. 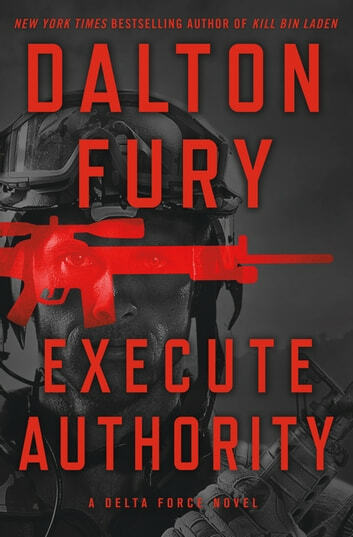 Miric’s grudge is with America, and one American in particular—the Delta Force operator who cost him an eye, Kolt Raynor. Raynor believes that Miric’s killing spree is only just beginning, and his suspicions are proved true when Miric is photographed crossing the border into the United States. Forbidden by law from operating on American soil, Raynor will have to bend the rules until they break, risking everything in order to run the assassin down before he can strike again. But what Raynor doesn’t realize is that Rasim Miric is also hunting him.